7.52 points at 25 votes (rank 196). The aim of the game is, to direct a laser beam towards a reveicer. For this the player has several mirrors, whose angle (and therefore the direction in which the laser is reflected) can be changed. To make the whole thing a bit more challenging there are also other objects on the screen: mines, "cells" (look like balls), polarisation filters, fiberoptic feed throughs, random deflectors and simplistic obstacles which block the beam. Every now and then enemies appear (the "Gremlins"), which alter the mirrors you have adjusted with effort. You can destroy these enemies with the fire button, if you position the cursor onto one (it is done easiest, when you get them on a mirror). At the start of a level the way to the receiver is blocked by obstacles, which disappear, when all "cells" have been destroyed by the laser beam. The laser is equipped with limited energy; if it is used up, the player will lose a life. As the energy is reducing constantly, the time which is available to finish the level is limited. Another possibility to lose a life is an overload of the laser. This happens, when the laser beam is reflected into the laser source, hits a mine or the laser beam is too long. If the state of overload is not resolved within a few seconds, you will lose a life. 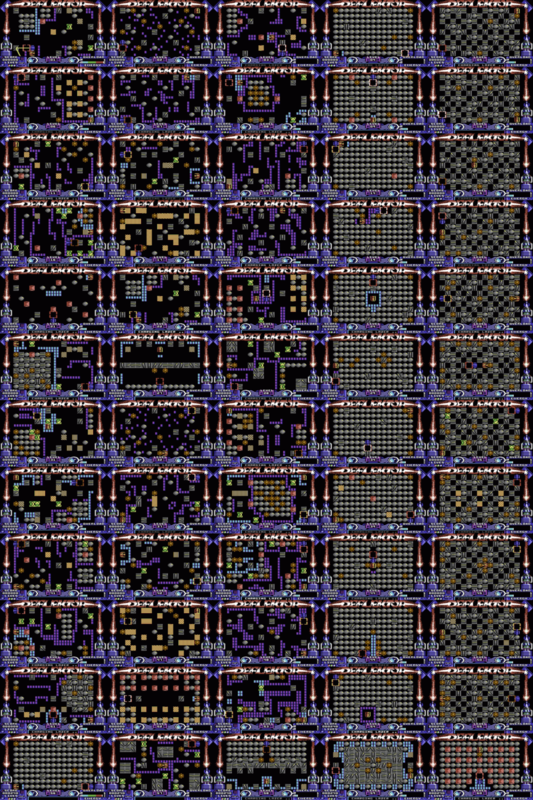 Each of the 60 levels has the size of one screen (no scrolling). Clear and well defined objects make for a good playability. The endless background music is nice... but endless - fortunately you can switch it off before the start. 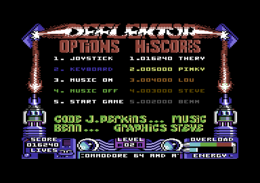 Useless statistic information: Deflektor uses 15 of the 16 colours of the C64. After finishing the last stage game finishes with message "Game Over"
Key 1 / 2 = controls the game by joystick/keyboard. Key 3 / 4 = to switch music on/off. The quadratic cursor is moved into the corresponding direction. If the cursor is placed over a mirror, the mirror turns in clockwise direction. If the cursor is placed over a mirror, the mirror turns in anti-clockwise direction. If the cursor is placed over the mirror turning monster, the monster will be destroyed. Key Return + Key Z Turns the mirror in clockwise direction. Key Return + Key X Turns the mirror in anti-clockwise direction. Key Return If the cursor is placed over the mirror turning monster, the monster will be destroyed. Key Q to return to the title screen. This is only saved in the REMEMBER version. If you have reached a high enough number of points, you can enter the list by typing your name and confirming it by pressing RETURN. Only a maximum of 5 letters per entry is accepted. From here the laser is shot. You have three per level. This is where the laser beam needs to get to. They can absorb or reflect the laser beam. Let the beam through only in certain angles. Divert the beam (you can only see the two ends). If a beam is directed onto a mine for too long, the mine will explode. This costs a life. Reflect the beam dependent on the angle of the mirror and can be turned. You need to make them all burst with the laser beam. Overview of all 60 levels of the game. Here you can also see, that the solution is not really easy in the higher levels. The REMEMBER version offers the following cheats: unlimited lives, no overload, no gremlins, setting the starting level. Klaws: "The game is based on a simple concept, which you can see through after a few seconds. At the beginning the game is very gripping, but after a while it gets rather boring. The difficulty level is low and does not really grow during the game. When I played the game for the first time, I already made it rather far, until I lost interest somewhere between level 40 and 50 (I didn't know then that it was not far to the end). As there is no save function, I would have had to play through all the already known levels the next time. So there was only this one round for me, which was, however, great fun. So if you want to spend some time with a gripping game, you should in any case try Deflektor. But one will play it only a few times." Guybrush "At the beginning it is a nice tossing, which soon bores. It reminds my -by the concept- of The Incredible Machine which was later successful on the PC. Due to the missing long time motivation I can give Deflektor only 4 points." 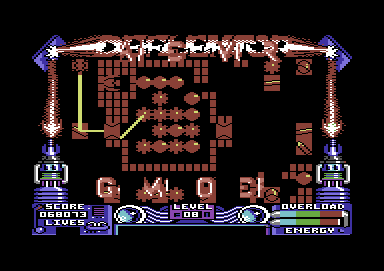 Darkstar: "At that time an innovative, new game principle, which made it to captivate me for a long time." 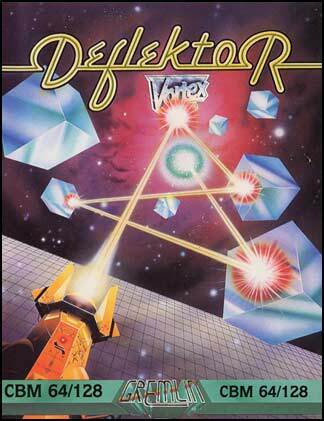 Deflektor was originally developed for ZX Spectrum. In addition to the C64 version there were conversions for Atari ST, CPC and Amiga. 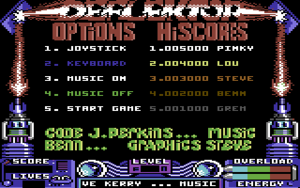 The Atari ST and the C64 versions were coded by Jason Perkins, who also worked on the C64 versions of Avenger, Monty on the Run and Jack the Nipper. This page was last modified on 29 November 2016, at 09:39.